There is a line that runs between the blade’s edge area and the ridge area. Between this line and the bottom of the blade (the area hidden inside the sheath) is called nakago (tang). 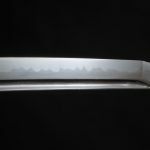 The nakago is shaped by a particular form of filing, before the signature of the sword is cut into it for the final completion. This makes it the last part where the swordsmith puts in his soul during the sword-making. 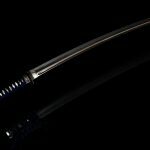 Fine swords of course have an excellent blade area, but the nakago is also made with excellence and simply observing the nakago can give an indication of the swordsmith’s skill. 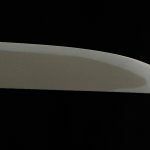 The shape of the nakago and the style of filing has distinct features depending on the age and school of swordsmanship, making it just as important in the authentication process as the blade. There are largely two types of nakago. 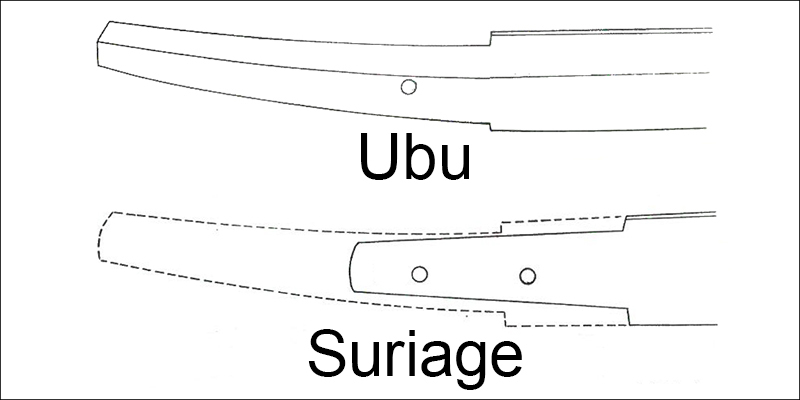 The ones that are left as it is when sword was made are called “ubu”. Those that have been amended at later times are called “suriage”. The suriage nakago sometimes have the signature and filing intact, while others times the original nakago is completely changed (called “o-suriage”). 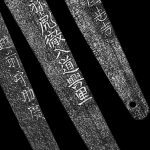 Usually swords that undergo o-suriage become signatureless, but sometimes, in order to preserve the signature, the signature part is bent to the other side in the suriage process (called “orikaeshi nakago”. Below is a list of some prominent nakago styles. 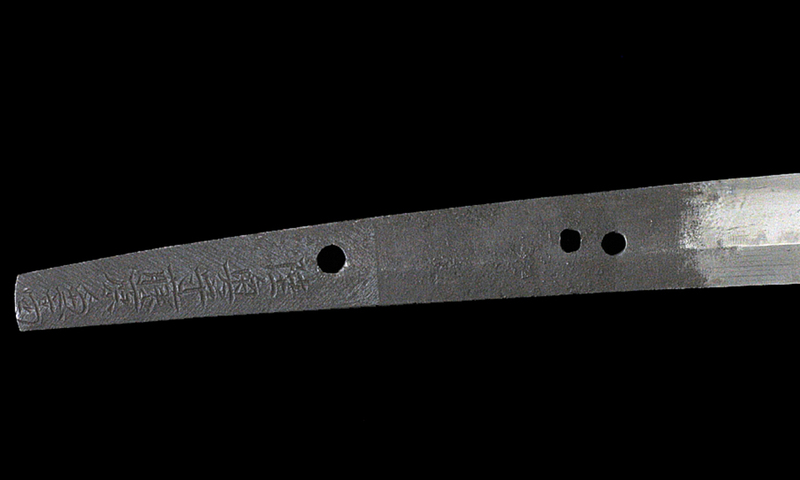 The nakagao is long in length, and only the base part is straight with the end part bending strongly to create a thin end. This is seen a lot in tachi and those made between the late Heian and late Kamakura era. This is the most common type of nakago in both old and new swords. 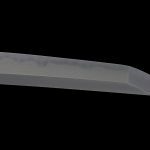 It is not an exaggeration to say that this type covers the vast majority of swords. During the tachi era the bend was seen in the nakago itself, but as the use of the sword switch to more of a hacking style, this bend became more subtle. This nakago was created in order to be put into the Efu tachi. It looks like the shape of the thighs of a pheasant. 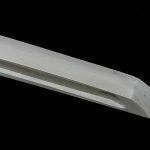 The Efu tachi needs the rivet attached to the shaft to make it stronger, so a part of the nakago, on the blade-side, is shaved off so it does not touch the bottom part of the rivet. This is how it became this shape. The width of the Nakago remains the same (instead of getting thinner toward the bottom) but has a strong bend, and it looks like the long sleeve of a Japanese dress fluttering. This is seen in the short period between the late Kamakura and the Nanbokucho Era, in daggers only. The curved line on the blade-side of the Nakago looks like the bottom of a ship. This is seen from the late Kamakura until the Muromachi period in the Soshu (Kanagawa) school and schools that were influenced by the soshu swords. This is based on the Ship-bottom Nakago, but the end is thinned, and it looks like the belly of the tanago (a kind of fish). It is also called “Muramasa Nakago” as Ise Muramasa favored this type. Yagen is a tool with a slight curve that is used to grate medical herbs. Noda Shigeyoshi, who was a prominent figure in the mid-Edo period, favored this style so it is also called “Shigeyoshi Nakago”. There is a cut in the bottom of the nakago, which creates a ladder-like shape that loks like the gohei which is the staff with plaited steamers used at the shrine in Shinto ceremonies. This is only seen in the work of swordsmith Isenokami Kuniteru during the Edo period.